Earlier this year, we ran a Creative Writing contest for young writers between the ages of 16 and 18. It gave us the opportunity to read through hundreds of excellent submissions received from all across the country. 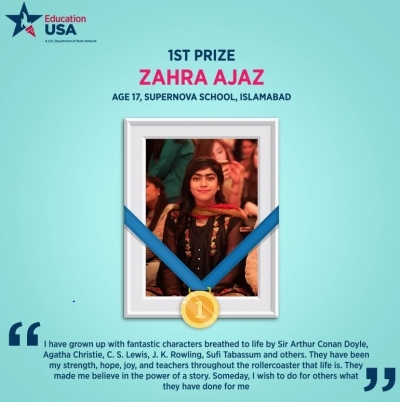 Presented here is Zahra Ajaz’s submission which was awarded first place in the contest. She’s currently a student at Supernova School in Islamabad. “Oh! this awful rooster” Sometimes I fantasize about running it over. It isn’t even the crack of dawn yet and it is crowing itself hoarse. It definitely needs a nightcap. I pray with all my might that it hasn’t woken Ajmal up yet, but I know that the rooster is loud and persistent enough to wake half the village. And sure enough, a few moments later I see a light flicker on in Ajmal’s window. While the villagers admire Ajmal’s work ethic and his ability to remain punctual come rain or shine, I can’t help but groan at the thought of the chilly winter morning ride to the plant nursery. I used to be sprightly and brave like my master, but after serving the family for more than 20 years, I think I deserve to sleep in until the sun is up. As I moan and groan, the lean figure of Ajmal bounces into view, and suddenly all my trepidation gives way to joy. His hopeful, happy, and youthful smile fills me with a balmy feeling. I finally feel brave enough to soldier through the exhausting day ahead. After Ajmal has said his Fajr prayer, fed his animals, and had breakfast with his ailing mother, he gives me a thorough check-up and a quick bath and with a splutter and a bang we are off into the weak rays of golden sunlight that have begun to break the inky sky. I am a blue Vespa that Ajmal’s grandfather bought almost two decades ago. Fortunately, a year later I was passed down to the…uh…more capable hands of Ajmal’s father, after grand-dad almost swung me headlong into a truck’s side. From then on, I have been a part of this family. We don’t have much but we have faith, hope, and friendship, and that is always enough. So, back to the present! After a ten-minute joint-jangling ride on the moist, pot-holed dirt road through the village, we turn on the smoothe bituminous road that leads to the city. On the way, we stop over at Sardar Jee’s nursery and store for some gardening supplies, and I suspect, for a peak of Surinder Kaur, who helps her father run the family business on the days off from college. Though Ajmal tries his best to act casual, it is hard to miss how his hand jumps to his hair, or how his cheeks glow crimson every time Surinder passes by. Though, I wish Ajmal would stop spluttering when Surinder is at the till. It is mortifying! As we get closer to the city, the serene, quite scenery dissolves into streams of cars, bikes, and buses honking their way towards their destinations. We are stuck in a particularly maddening bottleneck. Bored from repeatedly cursing everything from the population growth and the lack of a good and affordable public transport system, to my kismet and Ajmal’s hot, sweaty buttocks, I take to observing the passengers around me. Standing uncomfortably close to me is a fading red Suzuki Mehran. “Does nobody understand the importance of personal space in this country”, I grumble to myself. The family inside the car seem to be dealing with the traffic situation much better than myself: the father is drumming his fingers at the steering wheel and nodding to the music while the girl in the front is sleeping with her head resting against the window. I catch a glimpse of the son in the backseat in my side-mirror; a boy around fourteen rocking back and forth, his fingers stuffed in his ears, eyes zooming across his notebook. Finally, we emerge from the security check-post, and as I overtake the bus in front of me, I breathe a sigh of relief to see the foothills sharp against the pale blue sky. F-6 must be close now. It is a posh sector of Islamabad where Ajmal works at Khan Sahab’s beautiful house. Today he must start working on Bibi Jee’s kitchen garden. It is going to be a looooong month…. Finally, we pull up in the long, neat driveway that is wet from the soapy water off the gleaming spotless cars. I stand out against them as a striking oddity, with my peeling faded paint, the truck art motifs painted in dazzling colours on my front, the gaggle of bright yarn balls hanging from my handles, and the carrier on my back laden with tools. Ajmal parks me under the shade of my favourite Kachnaar tree, unloads the tools, pulls open the helmet storage and carries the seedlings place carefully inside, over to the garden out back. Watching Ajmal’s back disappear around the corner I know that it won’t be before noon when I will see him again. One by one, all the members of the household leave for work or school in their posh, shiny cars. The servants look more relaxed now. One or the other can be seen ambling in or out of the house. The guards sit in the grass outside the gate and I can hear them mulling over the latest news in politics. Elections are around the corner and politics is the topic of discussion everywhere I go. I feel relieved when the discussion is broken by a beautiful Seraiki tune issuing from the radio. I personally find politics as distasteful as I find music beautiful. My homeland is blessed with rich and diverse music and poetry from different corners of the land. A melting pot of many cultures, religions, languages, and lifestyles, it is home to arts unlike anywhere in the world. A romantic inside a grumpy old scooter, I am grateful that this is my home. “What a day!” Ajmal has finally emerged from the garden. He washes his hands from the hose nearby and sits down with the other servants on the Dari (a straw mat) for lunch. Some have brought lunch from home: others carry out plates of steaming food from the quarters. They sit together and chat animatedly while sharing food. The air is sweet with the aroma wafting from soft roti, fresh sabzi and daal, golden mangoes and ice-cold lassi (a yogurt drink). It is times like these I wish I was a human. Sun has begun to sink into the folds of velvety darkness, as we bump along the dirt road cutting through the lush green fields. Instead of the seedlings, the storage under the seat now contains medicines and a kilo of rice. Amma Jee, Ajmal’s mother looms into view sitting on the charpoy and smoking a hookah under the yellow glow of a filament bulb. She raises a wrinkled hand in welcome and a peaceful smile lights her face, as she too looks at her son making his way home.